Recognized for her work in Cowley College’s Criminal Justice program and her volunteerism, Debra Arnett was named the school’s September Student of the Month. The criminal justice major from Wichita, KS and her husband, James, have five children. 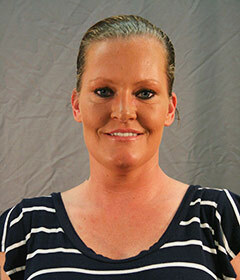 Arnett, who received her GED in 1992, decided now that her kids are older she would pursue her college education. She began taking classes at Cowley in the summer of 2015 after touring the criminal justice program with instructor Frank Owens. “I was impressed with the lab and simulator room and decided Cowley was a better option than the other schools I looked at,” Arnett said. She began making the one hour and 10 minute commute from her home in Wichita to attend classes at Cowley’s Arkansas City campus, five days a week. The drive was worth it to Arnett. At Cowley, she is a member of Phi Theta Kappa and a volunteer for the Upward Bound/TRIO program. She was promoted to Lieutenant in the Criminal Justice department and received a 5 Percenter Award in Criminal Justice for service above and beyond. She organized the Blue Santa event for Cowley’s Criminal Justice department and collected items for the school’s clothing drive. She has a 3.8 GPA and was named to the President’s and Dean’s Honor Rolls. Away from Cowley she serves as a Girls Scout Troop Leader and is a volunteer at Lake Point nursing home. Arnett has always had a desire to help kids that have had a tough life. While continuing her education she hopes to earn an entry level position in a juvenile detention facility and eventually become an intense supervision probation officer. “I look at those individuals not as who they are when they come in at that point, but more as who they can be,” Arnett said. The Student of the Month honor came as a surprise to Arnett. After graduating from Cowley she plans to transfer to Wichita State University and continue majoring in Criminal Justice.